OUT OF STATE ADOPTIONS: We do allow out-of-state adoptions for dogs, however, the adopter MUST come to Houston to get the dog and take the dog home with them. We do not allow our dogs to be shipped. Also, our puppies can only be adopted to the immediate Houston vicinity as it takes 4 months to get them completely vetted at our vet here in Houston. We will not allow our dogs/puppies to be adopted out of the area without being spayed/neutered. We spay/neuter puppies at 4 months old. Hi There! I'm Hart! Little known fact about me, but I'm pretty sure @therealtaylordayne wrote her famous song about me! 'Tell it to my HART, tell it to my HART, I can feel my body rock every time you call my name....' I'm almost a year old, crate trained and love all people and dogs! I know how to sit. I have lots of energy and love to run and jump and be active. Seeing as I'm an active girl I need to have another active active dog in the house to play with. Oh won't you please take me home? 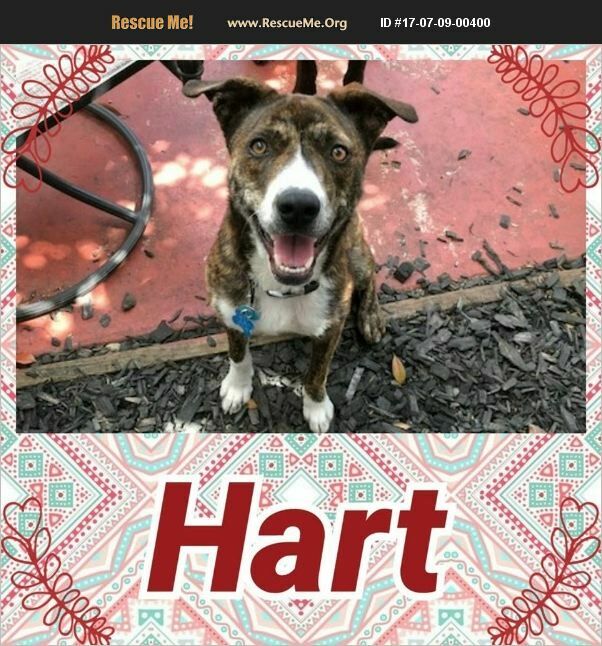 Hart is a Female Plott Hound / Lab Mix that we estimate to be born around 4/8/2017 and weighs between 35-40 lbs. PUPPIES: Young puppies that have not had their second round of puppy shots will not be at the Adoption Center for our weekend adoption events. If you are interested in adopting a puppy, please fill out an application on our website http://www.k-9angelsrescue.org/k9_angels_rescue_application_to_adopt.html. If your application is approved, a meeting can be arranged. Also, we only adopt young puppies locally due to the 4 month time frame it takes to get them fully vetted and altered. OUT OF STATE ADOPTIONS: We do allow out-of-state adoptions for dogs, however, the adopter MUST come to Houston to get the dog and take the dog home with them. We do not allow our dogs to be shipped. However, we only adopt young puppies locally, due to the 4 month timeframe it takes to get them fully vetted and altered. SPAY/NEUTER: As we believe proper healthcare of one's pet is a requirement of good ownership K-9 Angels Rescue only adopts out dogs that have been fully vetted. If the dog being adopted is not already altered at the time of their adoption, the dog will be altered within 2 weeks of adoption at our vet at our cost, with the exception of puppies which will be altered as soon as the puppy is ready. NOTE: All dogs are officially the property of K-9 Angels Rescue until they are altered by our veterinarian. Please LIKE and share our Facebook page: www.facebook.com/k9angelsrescue.